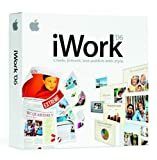 iWork ’06 requires Mac OS X version 10.3.9 or v10.4.3 or later, a Macintosh computer with a 500 MHz or faster PowerPC G4, PowerPC G5 or Intel Core processor, 256 MB of RAM (512MB recommended), 32MB of video RAM, QuickTime 7.0.3 or later, and a DVD drive required for install. iWork ’06 includes Pages 2, a powerful word processor that’s perfect for everything from letters to newsletters to brochures, and Keynote 3, next-generation presentation software for building cinema-quality slideshows, photography portfolios, animated storyboards and more with ease and elegance…. This entry was posted in Software and tagged Apple, iWork by Computer Education World. Bookmark the permalink.